I had a request a few weeks ago for a “day in the life” type post. I LOVED the idea! It was really fun for me to take lots of pictures of everyday. I did this two weeks ago (yes… it took me that long to get it live!). Mondays are one of my favorite days of the week. The craziness of the weekend is over and it’s time to get something done. Enjoy a little peak at the everyday and at my cute babies. Baby woke up for an early morning feeding; I had my alarm set for 5:30 am so this worked out great. I fed him in bed and checked email and such on my phone and was on my computer by 5:30 like I had planned. I wake up between 5 and 5:30 four or so days a week to work on the blog. This is when I write. I don’t log into anything distracting and just hammer out content for you guys. I’ll occasionally edit photos in the morning but my best writing comes when I’m not tired, rushed, or distracted so that is pretty much what I do in the early morning. I work until 7am and if anyone wakes up before then they are allowed to read books and entertain themselves. 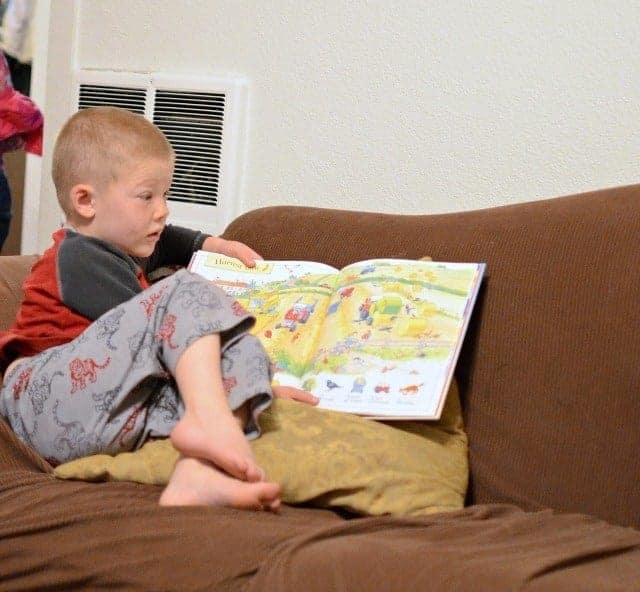 Henry woke up around 6:30 so he sat on the couch and read. 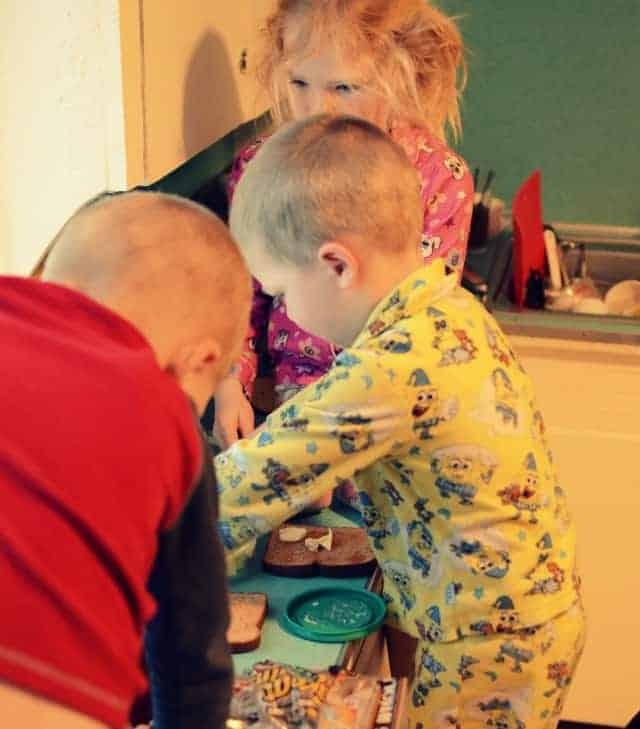 The kids wake up, we make breakfast (I make the eggs, they are in charge of making and buttering the toast for everyone). We eat, get dressed, wash faces, I do May’s hair, we find shoes… general morning business. Then her and I leave the house at 7:50 am to walk to one block to her Kindergarten class. About half the time her dad walks her to school. I love taking her though. It’s just her and I (Thomas works from home so he’s still there and I leave the little boys). We chat and then I can walk into her class room and be there with her until the bell rings. It’s a little one on one time that we both enjoy. I get home at 8:10. The baby is just waking up and is ready to eat. Kimball and Henry are up, dressed, and ready for the day. They want to get out trains which I do, and then I go and sit on my bed for a quiet minute to read my scriptures and feed the baby. It’s a nice way to start the day. While the little men are playing trains the baby and I clean up my room, make my bed, clean up breakfast dishes, sweep the floor, wash the counters and table (those toast makers are messy! ), and the we fold 6 loads of laundry that I got washed and dried over the weekend but not folded or put away. The little boys were content playing trains and surprisingly not trying to kill each other, and so I let them play. If they would have been fighting or done playing then they would have “helped” me get the chores done. They are great at washing off surfaces, folding towels, organizing the shoe shelf… but today they were happy and I just buzzed through the mess alone. 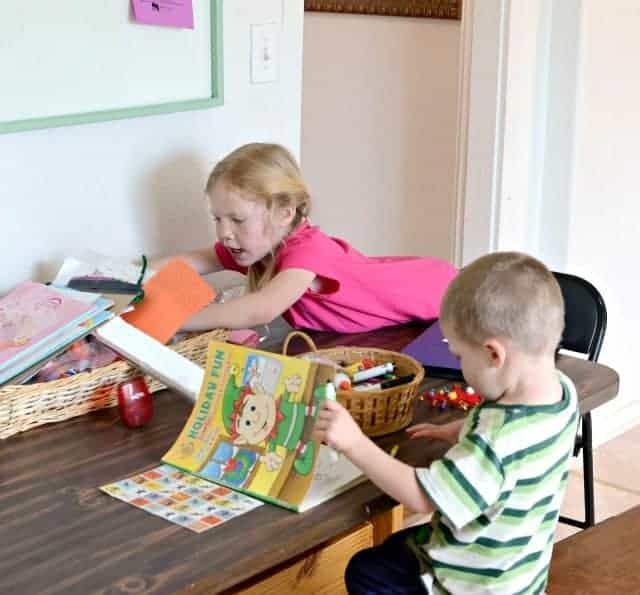 It was the first Monday of the month and so I did my monthly calendar for the family, sat down and looked at what I wanted to accomplish on my blog, checked when the bookmobile would be in town, figured out my days to teach preschool, ect. I talked to my sister on the phone while I was doing this too. Having a calendar and planner really help me to get a lot done. I don’t have to sit and think about what I need to do because I have a list at all times and so I can just bounce to the next thing. I’m also a very spacial organizer and so if I know what’s coming then I can get parts of it done ahead of time. Even little things like having a place to set things that need to go downstairs helps. When I’m headed down there to get a blankie or new pair of pants (we are in the middle of potty training…) then I can take something from the pile down too. Multitasking and planning are keys for my productivity. I throw a couple of pork roasts in the crock pot for dinner now too. The baby went down for a nap so this is when I like to play with the other boys. We play in the sandbox (I am a master sand castle builder and they are master sand castle stompers), jump on the trampoline, or a million other outside things. This is when I try to be very focused on them. I play with them, not just supervise. The activities ebb and flow to whatever catches their fancy, but it is always a lot of fun. Sometime during this time we feed and water the chickens and they collect the eggs. My sister-in-law and nephew now live next door so they came over to play and we had a great time. The weather was perfect and we spent two and a half hours playing before we even noticed that we were hungry. This time during the summer is when we go to the garden and weed, harvest, tend animals. If the kids aren’t helping me in the garden then they are off exploring and building huts on the property. And in the winter this is when we’d do a hands on craft (painting or something messy like that), read books, and/or take a bath. I made a quick lunch of chips and salsa and green smoothies and then I sat down to feed the baby while the boys finished their lunch. I pulled out my phone to check Facebook, moderate comments, and scroll through Instagram. I work on the blog from 1 until 2:30 pm most days of the week. This is either taking pictures or computer work (emails, editing pictures, social media, writing, more emails…). Today I planned on doing a big photo shoot and spent my time in the kitchen. Cupcakes were on the menu! And I had three awesome helpers. I baked the cupcakes the night before and we we made icing, decorated, and I did pictures. The official butter opener hard at work! The official cheerleader in his “vintage” throne. 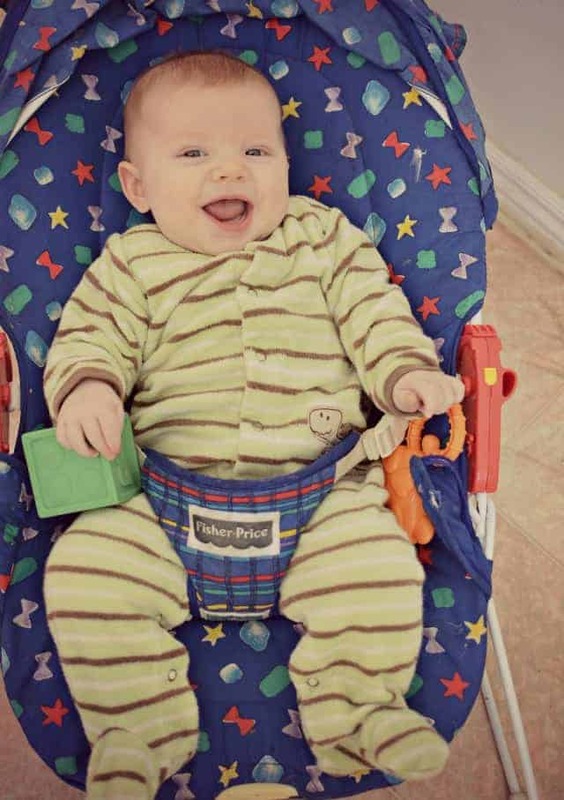 I’m so very grateful he is a happy happy baby. He’s very easy going and just loves to be around what we are doing. He’s happy to sit in his chair, he’s happy to be in his sling, he’s happy to be held. He’s just a little ball of joy. And of course they are excellent icing taste testers and decorators too. I always make sure I have enough for the kids to help. I hate telling them they can’t have something or help because I need a perfect picture… so I just plan on them helping and it works great for us all. I take everyone with me to walk to the school. I wear the baby and push the little boys in the double stroller. When Macey is with me walking home I bet we look like quite the crew! After school it’s mom-mode again. Macey has homework in Kindergarten every single night. I think it’s totally weird, but oh well. So we sit down as soon as we walk in the door to do her math worksheet and her reading while I feed the baby (I sure feed him a lot… maybe that’s why he’s such a happy little feller). She has to take a Dr. Seuss book with her the next day and is having trouble deciding which one she’d like to bring. We have to read On Mulberry Street, The Cat in the Hat, and The Cat in the Hat Comes Back to decide which is best. The little boys are all piled around listening and before I know it and hour has gone by. I make a conscious effort to read to my kids every day. They love it; I love it. The Cat in the Hat Comes Back wins the vote and goes into the backpack. The weather is still gorgeous so we head outside to play in the sandbox. The baby is awake and goes out with us. 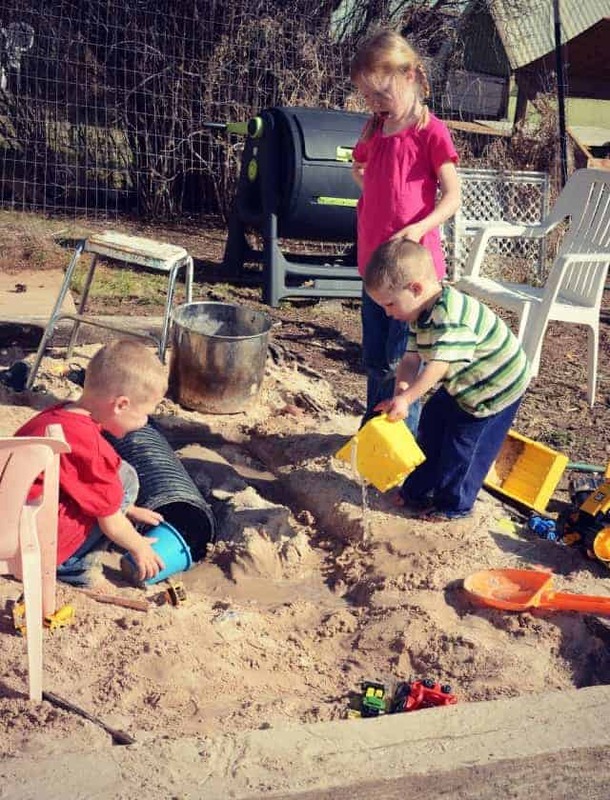 What makes adding a little water to the sandbox so very fun?! While we are outside my niece sees us and heads over to play. 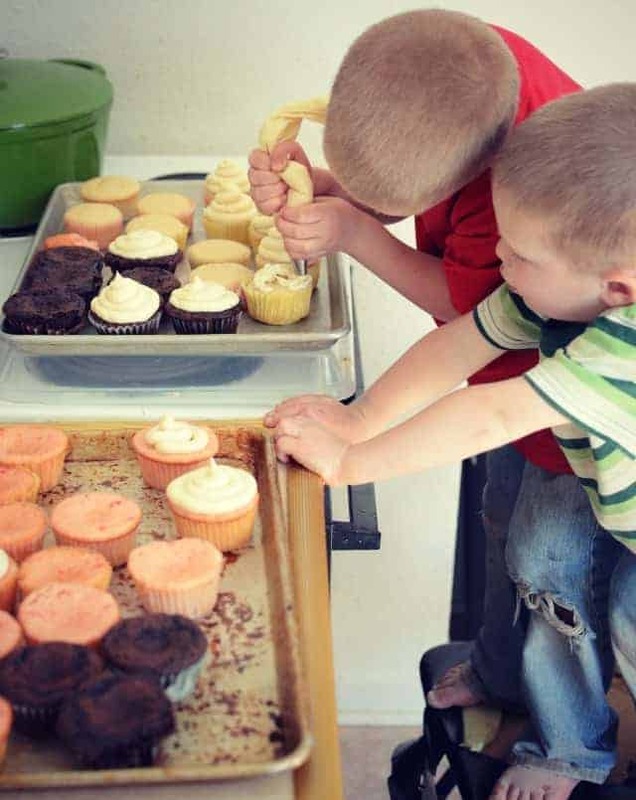 I need to clean the kitchen because it is totally trashed from the cupcake palooza, so the kids entertain themselves. Cousin Jane and Henry make a car track out of every book we own in the living room. I love when they are busy near me while I’m still getting things done that I need to. I chat with Macey about her day and things at school while I unload and load the dishwasher, wipe everything down, and sweep and mop. When Jane goes home I have the kids help me quickly pick up the living room and then I let them watch a show while I finish cleaning and get to making dinner. They watch a 20 minute show on Netflix while I shake the rug and sweep the living room, wipe down the bathroom and clean the mirror, and make dinner. I planned on pulled pork sandwiches in the crock pot which are quick and easy. The food is about done and the kids aren’t quiet finished with their show so I pop on Instagram and Facebook on my phone for a minute in the kitchen. After the show the kids help set the table. Their dad works in the afternoons building his hardware store, so he shows up at 6pm on the dot and we have dinner as a family. We eat and get the table cleared and wiped down. Monday nights are family night. We sing songs, have a lesson, and do an activity. My kids LOVE Mondays and I do too. This night is a golden teaching opportunity and we try to use it! We have lessons on anything from paying tithing and being honest to sharing pioneer/family history stories or stories from the scriptures. Tonight I invited over one of our favorite family’s to have family night with us and the kids are so exited. Susan and Richard have 8 amazing children and I always hope if we spend enough time with them that some of their parenting skills will rub off on me. They are the same family that helped us kill and butcher our lambs. And their oldest son is the one that I do the Etsy shop with. 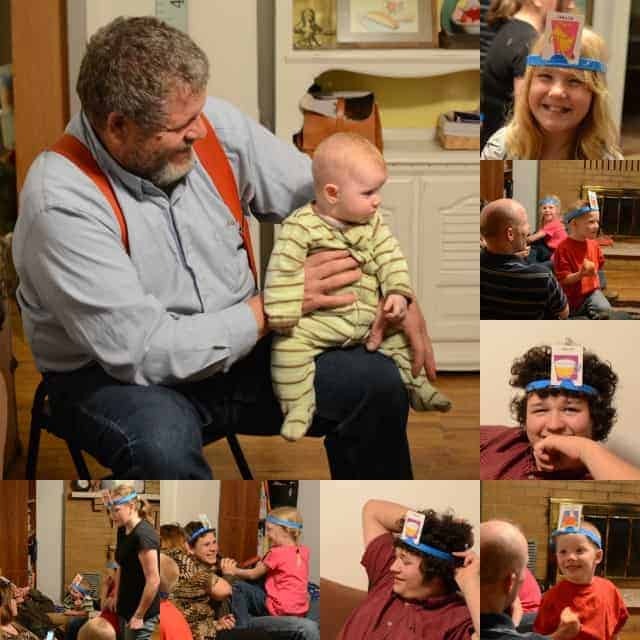 They show up and we sing our song, have a lesson, and then play charades, headbands, and a crazy thimble game that they taught us (and we loved!). And of course the treat for the evening is CUPCAKES! And yes, that was planned. I don’t make food just for the blog. I make food for my life and share it on the blog. I planned on having them over and I wanted to do some cupcakes posts, so I made them work together. On a normal night the kids would have taken baths and then read books with their dad instead of having someone over. After our friends leave the kids get on jammies, brush teeth, we read scriptures and say prayers, and then they are tucked into bed. It’s about 8:30 pm (and that is 30 minutes later than they normally go to bed). At 8:30 I clean the house again. I do this every night when the kids go to bed. I put my house to bed too. I don’t want to deal with today’s messes tomorrow. I wash the table and re-sweep the living room and kitchen (cupcake crumbs…). 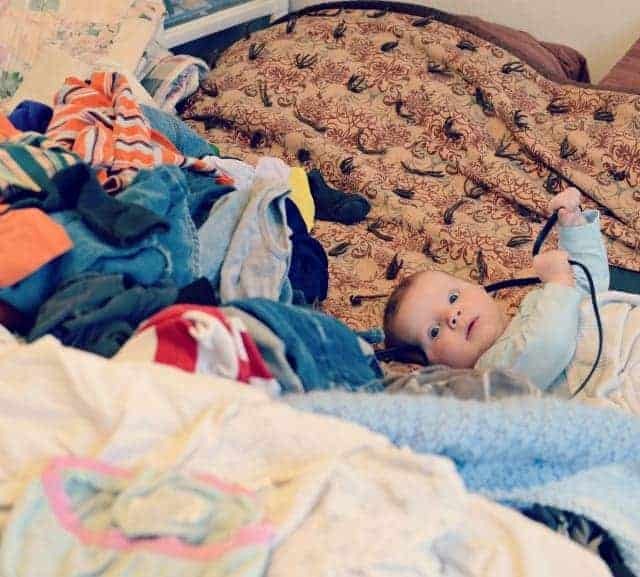 And I start a load of laundry. And then it’s computer/blog time again. 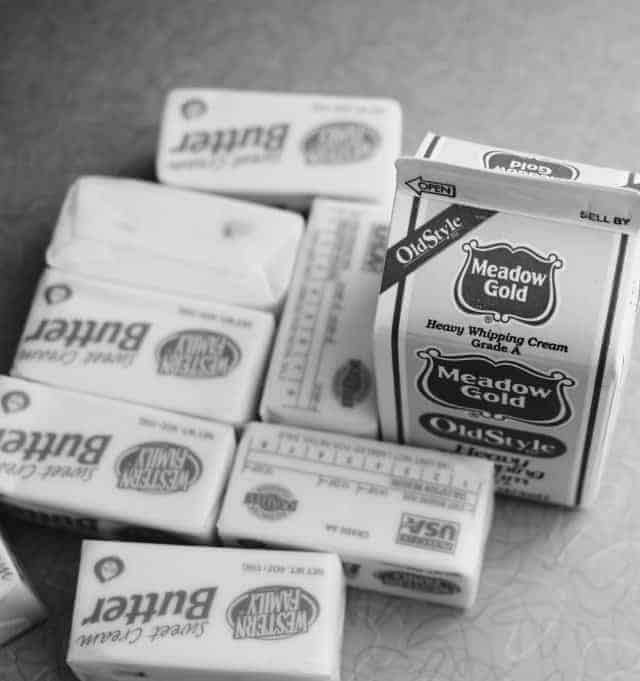 I blog from whenever my cleaning is done until I go to bed, normally another 2 hours. I’ll answer emails, edit pictures, do social media stuff… there is always something to do! And tonight I go to bed at 10:30 after I write in my journal, talk to Thomas a minute, and say my own prayers. And there you have one very normal day for me. I get a lot done in a day, but let me point out a few things. I didn’t shower, spend more than 5 minutes getting ready, or exercise. I didn’t really leave my house besides walking to pick up Macey; I didn’t shop, run errands, or have to drive anyone anywhere. I don’t watch any TV or shows. And I don’t spent a whole lot of time with my husband (he works at night while I am cleaning and working too…). We both take Friday nights off and spend that time together and we both don’t work at all on Sundays. That being said, we eat most meals together which is nice and if I need to talk for a minute he’s really good about being available when I pop in to chat. Those were all choices that I have made. I probably should spend a little more time on my appearance but I don’t. I don’t have my kids in extra activities because I like them at home with me (the oldest is only 6 and they do play t-ball and do swim lessons in the summer, but she doesn’t do cheer camp, gymnastics, dance, or some of the other things her friends are doing. They’ll be time for all that craziness later! ), and I don’t “go shopping” because stores are hours away. Normally one morning a week we’ll walk to the post office, bank, and grocery store and that is just about it. Not shopping is such a time saver AND money saver. We will do a big Saturday shopping trip to St. George every 6 weeks or so. I love having a set time in the afternoon (from 1 to 2:30) that I know I’ll be able to do what I want to do. I need that time. It also helps me to stay off my phone/computer/social media when I’m with my kids because I know that I’ll get the chance at that certain time. I like that my kids have very set screen-time. My kids love TV/shows/games/my phone as much as the next kid, but I am very intentional about when they are having screen time. When they start begging for a show at 8:10 am I just remind them they can’t watch one right now but they’ll be able to after lunch, and then I direct them to the things that they can be doing. Again, they like knowing what to expect. They don’t just pack around my phone, we don’t own any ipads, and nothing is on outside of that allotted time. I have super strong opinions about children and screen-time. They. Do. NOT. Need. It. Kids need sandboxes, trains, sidewalk chalk, play dough, and a mom who is willing to play, read, make messes, and spend time with them. When the weather is nice we will go days and days without watching anything at all and I love it and I think it’s super healthy. Can you tell this is a soapbox for me 🙂 I promise though that screen-time is your choice as the parent, not theirs as the child. Be intentional! And yes, I do spend quiet a bit of time cleaning but I have a bunch of little kids. My house gets so dirty so fast. My husband is working a million hours a week so he isn’t available to help with household things at all (and I’m ok with this, just FYI). If I want things to get done I just have to do them. If I keep it clean it really doesn’t take all that long to maintain some form of order. Don’t forget. This is my life, not yours. Read it with a grain of salt and don’t forget that I have those “just gotta survive” days too. There’s lots of poop in my life (potty training is miserable…), lots of kids trying to kill each other, and moment where I hide in my room “feeding the baby” after the baby is long asleep in my arms and I’m reading a book. I’m just trying to do the best that I can and some days, my best is keeping everyone clothed, fed, and alive. This was really fun for me to write, so thanks for letting me indulge. What do you think? Am I totally crazy? What works well for you? What do you struggle with getting done? What things do you make time for and other things do you skip (who needs to shower anyways!). Beautiful post. Beautiful life. I’m trying not to be jealous but I am!! I needed to read this this morning. My life has felt hectic, out of control, & I’m overwhelmed. I feel like life is just happening & I’m not living on purpose. You know what I’m talking about?? I know how to get it together (I think…) & need to. Life is too grand to be feeling overwhelmed. Thanks for a peek. I love reading your stuff. Thank you for sharing. 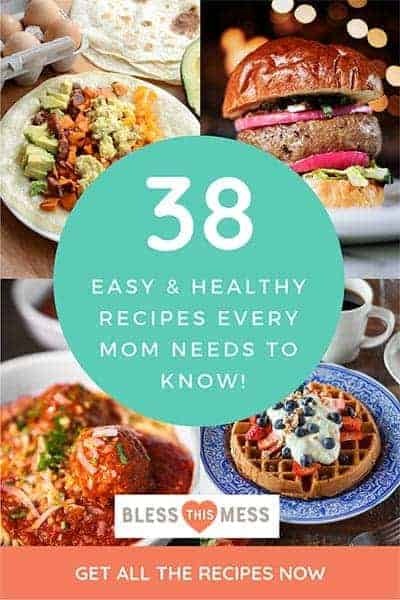 I recently found your blog on Pinterest and love it! I miss being a part of your daily life. You go, Momma. Those kids are lucky to have you. Thanks for sharing this! I admire you and your cute family! I loooooved this post! Thank you! I admire you and am so impressed…now I want to move to a tiny town where there are no stores 🙂 and I finally believe I can be a chicken farmer – hooray! Well I have you to thank for it V-ron! THANK YOU! 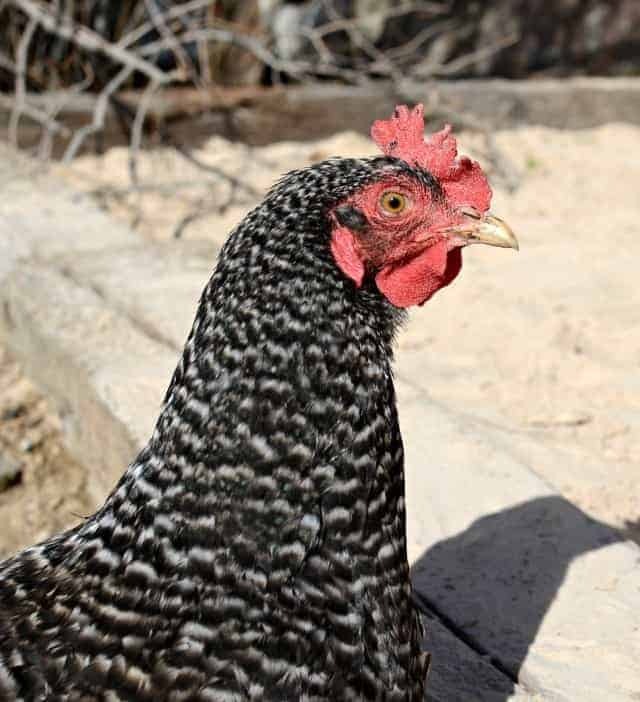 And yes, you can be a chicken farmer! 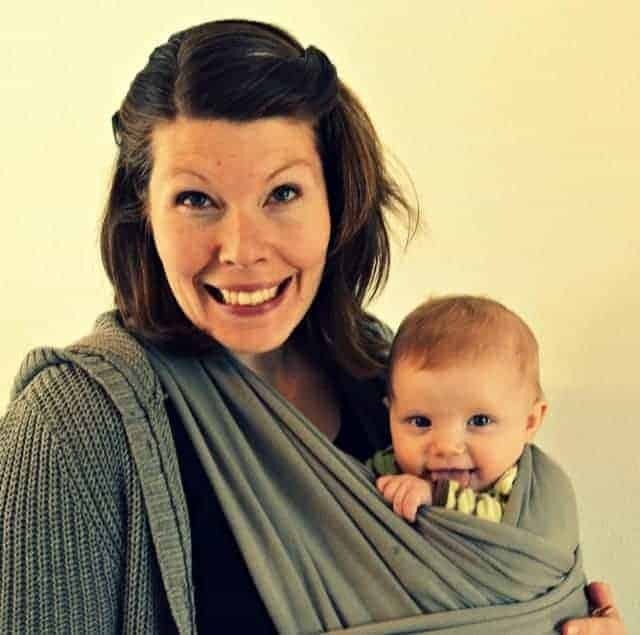 All your children are delightful, but the picture of your baby in the sling is so precious. He is happy, bright and obviously not only very well cared for, but secure and very well loved. What a good mom you are! Getting a shower every day is way over-rated and not good for your skin anyway! I would rather read a book too. Ok, most days I really do shower. I wish we were neighbors and our boys could make messes together! 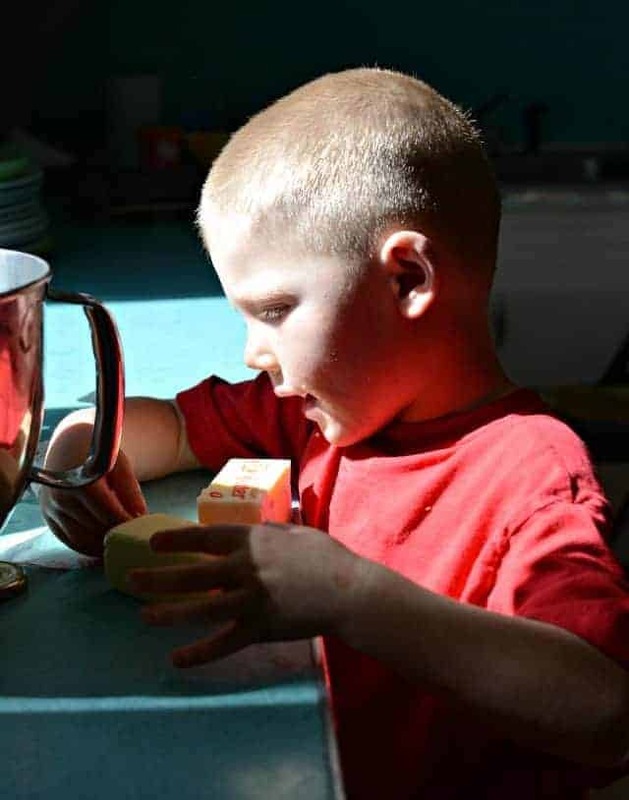 I loved this post, it makes life look so happy and makes me want to play with my kids more. and, those cupcakes look super yum! we do our FHE on Tuesdays (works better for the whole family) and I get to choose the treat tonight! 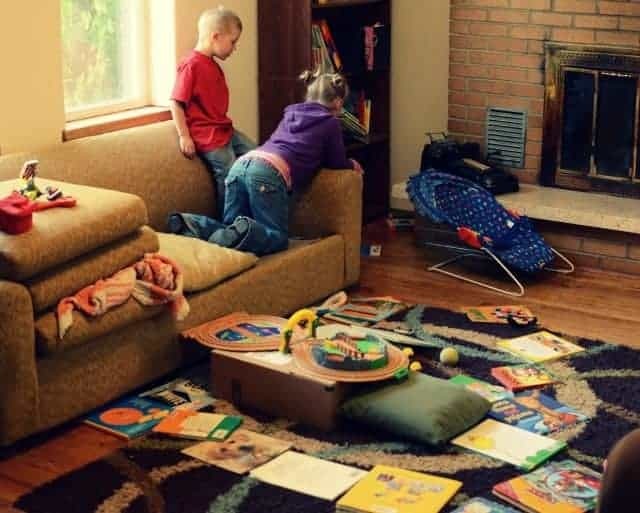 Our last neighbors had 3 boys and we LOVED making messes with them… please move in! We need more friends! 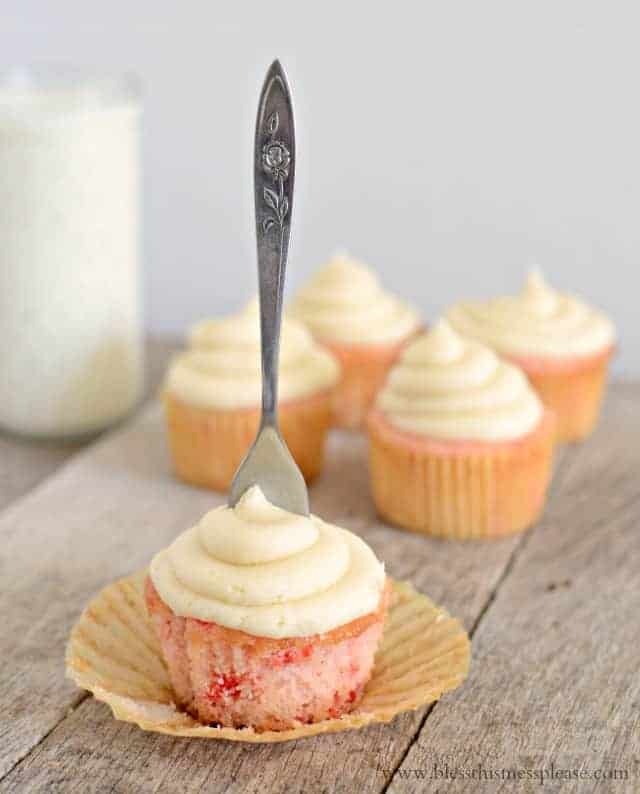 And I’m posting a cupcake recipe just for you today. Give me 30 more minutes and it’ll be up. I gotta help a sister out. They were good! I love this!! Thank you so much for sharing!! I’m always so interested to know how other moms do it & how their days go…so this was so fun to read. 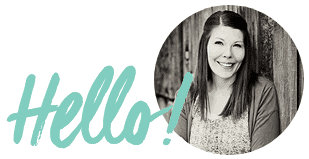 I loved seeing how you fit your blog/work in without sacrificing time with your kids. And I love how “real” you are & how you don’t try to put on a show or pretend to be something you’re not. You are amazing!! Such a good example for all of us!!! A beautiful family. It will start getting easier for you. Keep up all your good efforts. I’m exhausted just reading it. They’re lucky to have you. Sounds like a fun, rewarding day. Loved reading this! I am also super soapboxy about screen time (my kids get none at all except for our monthly Classic Movie Night) so it’s delightful to see someone else wax poetic about the same topic.